Posted byMei 17 February, 2011 2 March, 2019 7 Comments on Is Co-Sleeping good or bad for eczema baby? 1. Help baby sleep better. I believe this is true and especially important for an eczema baby whose itch may be preventing her from sleeping well. 2. Help build a stronger bond with parents. I think this is true too. When I was a stay at home mom and my hubby worked, after a few months, Marcie didn’t seem to get too excited when daddy came home. But if daddy co-sleep with her for two nights in a row, Marcie would display much more warmth towards daddy. 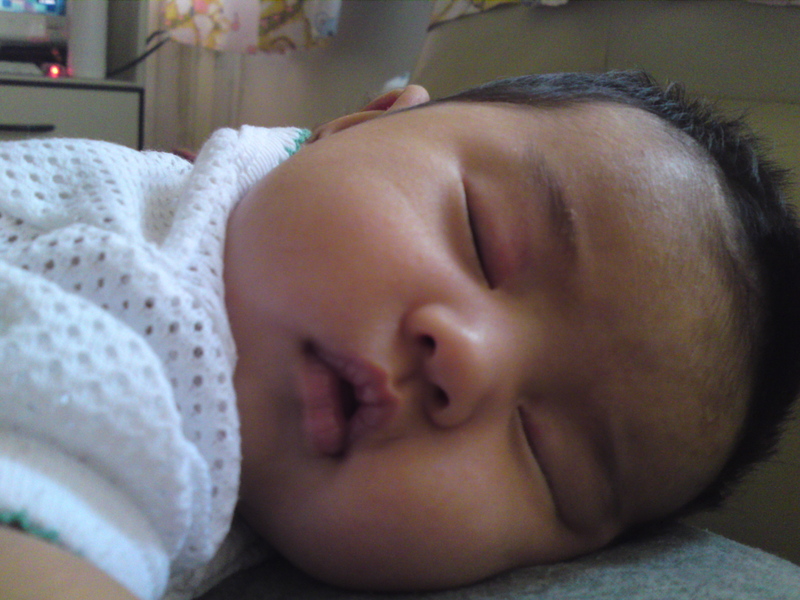 For me, I just love to look at my baby’s face when she’s asleep and smelling her milk-breath! 1. Risk suffocating baby. The verdict is still not out on this one. Some say the risk is higher while some say lower. My personal suggestion is to let your baby sleep alone in a very cool air-conditioned room but wrap her up to prevent scratching. When Marcie got too big to be swaddled, we tied her hands to her legs for a few nights but she couldn’t sleep well. That’s when we decided she’s big enough to not get suffocated/ crushed by us on our bed and it’s also the only way we know whether she’s scratching. Marcie started scratching ‘covertly’ at about 7 months old, when it became more difficult to know that she’s scratching as practically no sound was made. So the only way I knew was sleeping with her and detecting her scratching fingers move. 2. No good sleep for parents. That is so true especially when Marcie has eczema flare or teething which causes her body temperature to rise and somehow causes her skin to be more sensitive and itchy. For me, it’s a sacrifice I make and I compensate by sleeping earlier with Marcie. 3. Increase heat to baby. That is also true. I give off less heat compared to my hubby and I’m more aware when Marcie scratches. So I co-sleep with Marcie more often. Regarding the additional heat, you can compensate by turning the air-con cooler and dressing your baby light. 4. Make it difficult for baby to sleep if parent isn’t co-sleeping. Good news is babies adapt quickly and Marcie has no problem sleeping at infant care now. This was a great relief for me as I was worried whether Marcie could nap in school. 5. Prevent baby to be independent. No research results cast in stone for this one. Some studies now believe that making babies feel more secure will enable them to be more independent at an older age. 6. Prevent parents from their own couple time. This is true. Again we compromise by letting Marcie sleep alone first, and when she wakes up, I will then stop whatever I’m doing (usually watching dvd with my hubby) and quickly hop into the bed with her. We used to put Marcie in her cot but realise that she sleeps better on our bed. I do take precaution though. Marcie likes to lie flat on her stomach but she has good neck muscles at an early 3 month age. She’s always in the centre of our bed, without the possibility of wedging between the wall and the bed and our bed has no bed frame that may trap her. There’re also going to be a lot of objections from people around you if you choose to co-sleep. I think for parents with eczema children, it goes back to being confident about how you are helping your child with her eczema. if babies eczema is caused by dust mite allergy,than sharing one bed may make skin worse. I’ve to learn from you how to be part of so many mom/blogger network, I feel like an island sometimes, just like Singapore, where I stay! Another disadvantage of co-sleeping is getting virus from your baby.. I got HFMD in the form of flu from my baby.